Is your campus prepared to meet the changing academic demands, employment needs, and the increasing diversity of learners in the coming years? Does your campus take a reactionary approach to the ups and downs of the higher education market, instead of having a long-term plan to anticipate changes? 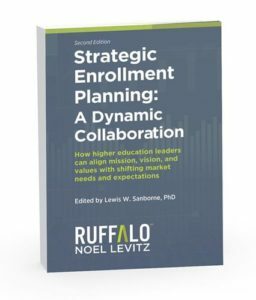 Strategic enrollment planning from Ruffalo Noel Levitz provides a systematic approach to achieving ongoing stability, ensuring that you can meet the educational, financial, and material needs of your students and your institution. Strategic enrollment planning is more than a long-term recruitment or retention plan. It is a data-informed process that aligns an institution’s fiscal, academic, co-curricular, and enrollment resources with its changing environment to accomplish the institution’s mission and ensure the institution’s long-term enrollment success and fiscal health. How does strategic enrollment planning benefit your institution?